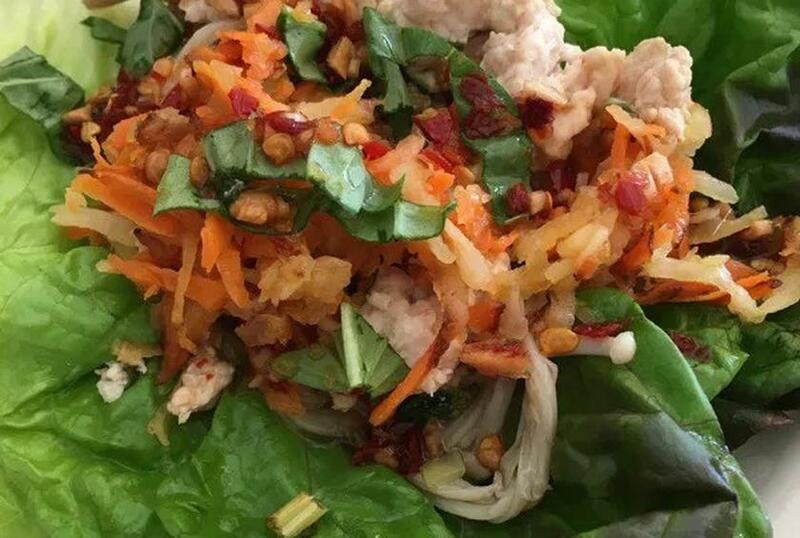 Here’s a simple recipe for chicken larb. There are many versions of this dish, sometimes using minced pork instead of minced chicken. Larb is known for its lightly spicy, citrusy, sweet and salty flavors. The common ingredients you’ll find are lemongrass, lime, red pepper flakes, and fish sauce. This refreshing dish can be served as a salad wrap over lettuce leaves. Chicken larb is great over rice too. Whisk together fish sauce, coconut aminos, lime juice, lime zest, and crushed red pepper flakes. Set dressing aside. Heat 1 tablespoon coconut oil in a large frying pan over high heat. Add in green onions, lemongrass, garlic, ginger and cilantro. Stir-fry for about a minute. Add the ground chicken breast and stir-fry for a couple minutes. Add 2 tablespoons coconut aminos and chicken stock. Cook for another few minutes, stirring well. Remove the chicken from heat. Pour dressing over chicken and toss or serve the dressing on the side. For salad wraps, set up an assembly station. Spoon the cooked chicken into large lettuce leaves and then add shredded daikon and carrots, enoki mushrooms, and fresh mint leaves as toppings.